Gus Powell’s The Lonely Ones is a book of enigmatic photographs paired with brief phrases that together create puzzle-like combinations, and often surprising emotional effects. The book was inspired by celebrated illustrator William Steig’s earlier book of the same name, which coupled drawings with text. Powell, formerly a photo editor at The New Yorker, where he encountered Steig’s drawings, drew from nearly a decade of his own work to produce a photographic “cover album.” It’s little surprise that Steig’s The Lonely Ones, a playful and strange little book, appealed to Powell as a model. The result, however, has a somewhat different feel than the book to which it pays homage. In 1942, Steig, known as the “King of Cartoons,” published The Lonely Ones, a book juxtaposing text and pictures on facing pages. On each left side page, the reader encounters an everyday remark: a commonplace offered as a rationalization, a justification, a protest. On each right side page is one of Steig’s illustrations of a bizarre little character against a blank background. “I am blameless”: a man sits under a palm tree, expression inscrutable. “This is one thing they’ll never take away from me”: a figure plummets from the sky. A tag with the number 37 trails from his head. Is he clutching a die? At times the effect is congruent, sometimes the pairing suggests a disconnection. 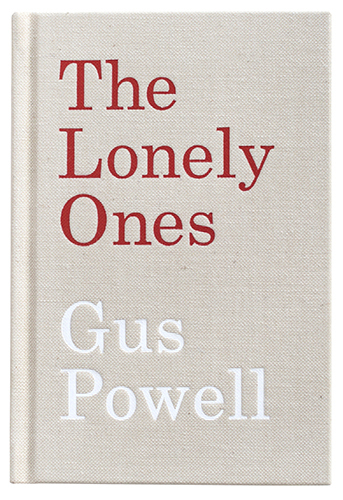 Powell is less skeptical than Steig, and his The Lonely Ones delivers a world where the lonely not only assert themselves in self defense, but also seek connection. The unruly enthusiasm that flutters and scrabbles around these protective confessions, the compulsive need to express our lonely selves, complements the dry humor and quiet energy in Powell’s pictures. Powell doesn’t want us to be cynical, but to delight in the uncanny. Curiosity propels the reader through the book. Powell’s phrases (which he “collected” himself) are more hopeful, more collaborative, than Steig’s characters’ sullen protestations, though the tone shifts a few times through the course of the book. Steig’s phrases are all I and me, but Powell creates a world of conversation. “Let’s not ruin it by talking” is paired with a photograph of a woman looking at a horse, at a distance from the camera, in the middle of a city. Who is speaking, the woman or the horse? Or is the observer asking a companion to be quiet so that the scene will play out? A brilliant cloud ascends over a hill: “We’ve met before.” “We are here to make you happy,” offer a circle of colorful lawn chairs in a clearing. They appear to be having a meeting, or perhaps they are only being referred to. From tiny objects in the dirt to majestic manifestations of weather, to the figures moving through cities, Powell presents a world that we can speak about and that speaks to us. Where Steig’s characters are isolated from one another and from the reader, Powell’s The Lonely Ones recognizes that we all live in the same strange world, one that may or may not be animated by talking animals, nature, and furniture, but which allows for joy and satisfaction. Like Steig, Powell allows us to laugh at our conceits. Our habits and desires have made invisible the absurdities with which we surround ourselves; Powell follows Steig in rendering these visible. Like a visitor from another planet, Powell finds nuance and grace in gestures of movement, color, expression and form, and like such an extraterrestrial visitor, he listens to what we say to one another and seeks to match these intimations with what he has witnessed. The results, to borrow from Roberto Benigni’s character in Jim Jarmusch’s film Down by Law, describe “a sad and beautiful world”. The construction of the book is a delight. Similar in size to its predecessor, its cover emulating Steig’s red text on tan binding, the modest book is easily carried, a portable object on which one can meditate. Rather than facing text to image, each picture is concealed inside a gatefold with the words on the outside of the fold. As you proceed past the title page, you are met with the words Let this be our secret on a page that then folds out to reveal its associated image, a rich and layered photograph that I will leave to be discovered. Each page proceeds this way, with the reader opening the gatefold to reveal the image: the words are more than a caption, they are part of the book’s sequencing. It almost feels as though the book was prepared for the personal pleasure of the reader. The effect is terrific: you can page the whole book, seeing only the texts, but behind each text is an image to be uncovered. The reader’s active participation is a significant aspect of the experience of the book, allowing the reader to feel like a conspirator with Powell and his photographs and for that a bit less lonely. All images © Gus Powell. Support Fraction and purchase The Lonely Ones here.